Dentures are removable prosthetic teeth that are designed to replace some or all of a patient’s missing teeth. Partial dentures can be worn by patients who are missing some of their teeth on a particular arch and work by anchoring on existing teeth to try and prevent movement with biting forces. Complete dentures can be worn by patients who are missing all of the teeth in a single arch and are supported by the surrounding hard and soft tissue. Most patients require their dentures to be relined or adjusted every one to two years. This is due to natural changes that begin to occur when teeth are removed. Without the roots present the bone and gum tissue in the jaw begins to shrink. These changes in the bone and tissue reduce the seal between the denture and gums causing movement. Poor fitting dentures will actually lead to more bone loss and tissue changes. Dental Implants are threaded titanium posts that are designed to integrate into a patient’s jaw bone and act as replacement for their natural tooth roots. Implants can be used to support a variety of prosthetics, from a single implant artificial tooth known as a crown to implant bridges. 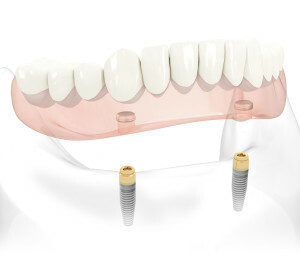 Implants can also be used to help retain dentures using specially designed components that allow the dentures to lock into place eliminating annoying or embarrassing movement. In cases of upper dentures, implants can eliminate the need for the palatal plate which can adversely affect taste and cause gagging problems in some patients. 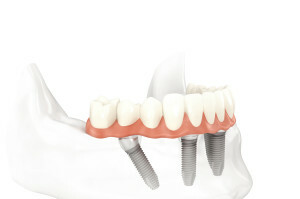 Implants also serve another important role for denture wearers. By taking up space in the jaw bone similar to tooth roots, they can help prevent future bone loss from occurring. There are three main types of implant dentures. Removable implant-retained overdentures are removable dentures that are held in place on the implants by clips (also called: balls or locators). 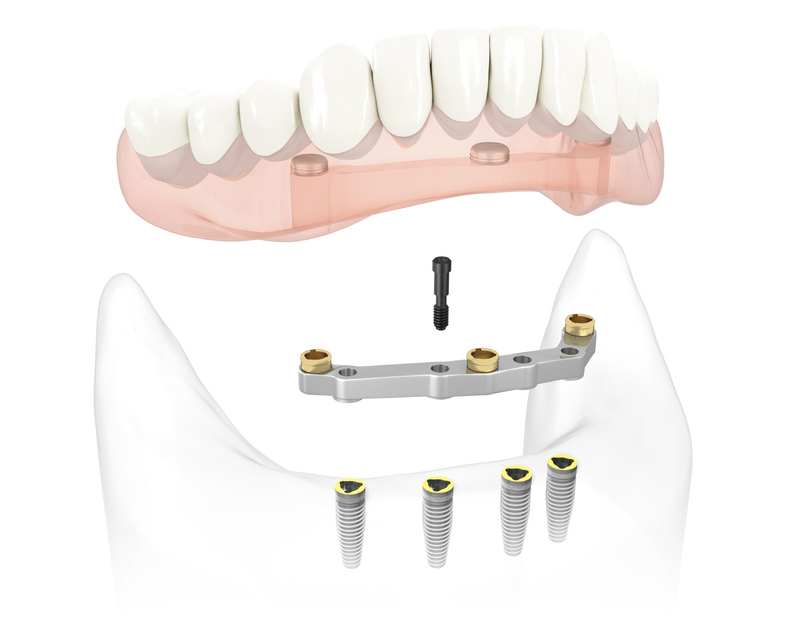 Removable implant-supported overdentures are removable dentures that use dental implants and a fixed metal bar to support the prosthesis. The fixed metal bar is supported by the dental implants and the bar, in turn, supports a removable denture. The denture does not actually touch the gums, so potential sore spots are eliminated. Fixed implant-supported overdentures are supported by multiple dental implants and cannot be removed from the mouth by the patient.